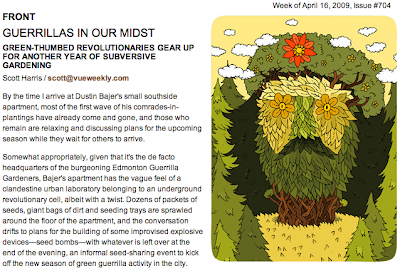 I much enjoyed the artwork and felt that the article did a decent job at highlighting some of our initiatives and providing a little history on the movement. With the exception of perhaps being overly critical of my own quotes (my doing, not the View's) I feel as though this article provides a great pushing off point for this guerrilla gardening year. I would love to opportunity to chat to as many people as possible about the up and coming year, plans, dreams, aspirations, and at the same time start some plants too. I have many seeds but you're always welcome to bring some of your own... we could use a few more sunflowers! -Small amount of potting soil. Follow the link and request an invite if interested. 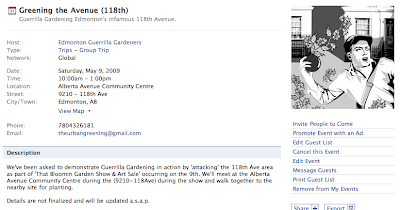 If you do not have Facebook contact me at 780.432.6181 or send an email to theurbangreening@gmail.com for information. Seeds are in! Thank you Bedrock Seeds! Thanks to a generous donation by Bedrock Seeds the Edmonton Guerrilla Gardeners are sitting on a nice little pile of native Alberta seeds. With some stratification and a lot of love, these seeds will be beautifying Edmonton's landscape in no time... not to mention increasing biodiversity, providing habitat for insects and animals, and returning a few natives back into the environment. If you would like to help propagate some of the seeds above (or anything else) please contact me. The creation of an online, publicly accessible, open-source map of the Edmonton featuring places of natural interest and the location of publicly available food. Entrails: Finding funding, familiarizing ourselves with Google Maps, canvasing the city for publicly available food sources, networking with other groups and organizations. There should be a large question mark next to this item. There has been some discussion of creating a green roof on top of a prominent Edmonton Business (with owner consent). A lot of things need to line up before this can become a reality (fingers crossed). Entails: Finding funding, networking with other groups and organizations, further discussions with the business owner. The continuation of the reclamation of an abandoned home site in the Mill-Creek Ravine area. The site has been abandoned for some time and currently consists of some rubble and a lot of invasive, non-native species. We started cleaning the site up and planting Edmonton native plants last fall and would love to continue improving and learning from the site. I also see some potential to play around with some permaculture principals and to include many native edible plants. 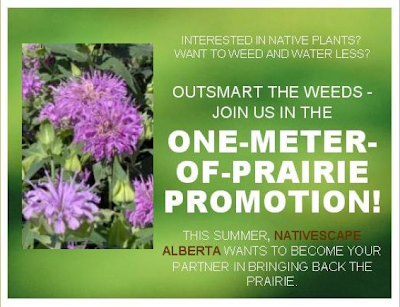 Entails: Acquiring more native seed and plant material (Bedrock Seeds, Edmonton Naturalization Group). The original Guerrilla Gardening act; we've decided to concentrate on three of four larger plantings this year as opposed to many sporadic little ones (though we still encourage it). There has been talk about doing one large planting for each of May, June, and July. We are, however, looking to be starting some seeds now. Entails: Finding three to four suitable locations (publicly accessible, visible, etc), acquiring seeds and plants. 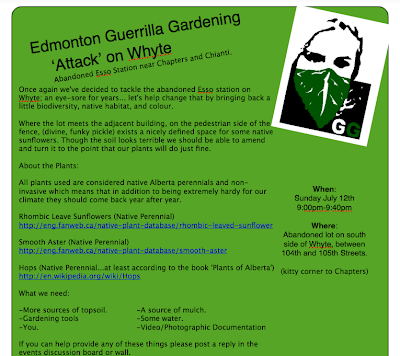 The returning of the Edmonton Guerrilla Gardeners to a previous spot and adding more food producing plants. Dare I say edible food forest? Entails: Learning more about the history of the site, consulting professionals on the creation of edible food forests, acquiring plant material. Last year, we were able to plant a vegetable garden together as a group. At the end of the summer, the food was collected and donated to the food bank. We would welcome the opportunity to do this again this year. 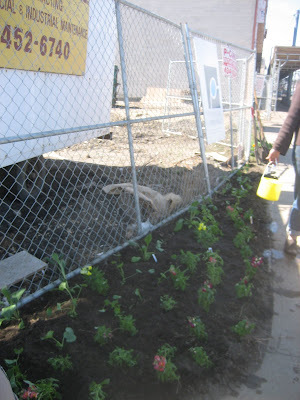 Entails: Finding a suitable Community Garden within the city (Let's Get Dirty Garden? ), starting some vegetables prior to planting. Tying in with the Edmonton Green Map a few of us thought it would be fun to take cuttings from many of Edmonton's Saskatoons (and other food producing plants) then propagate, and replant along the boarder of the river valley. Entails: Consulting a professional on the propagation of Saskatoons and other edible plants, locate suitable plants for cutting/seed gathering.